Poketo at UC San Diego! Instead of lovely Los Angeles skies, we will be saying hello to a beautiful San Diego skyline tomorrow. If you’re in the neighborhood, we’d love for you to come by and check out our talk at UC San Diego, Angie’s alma mater. 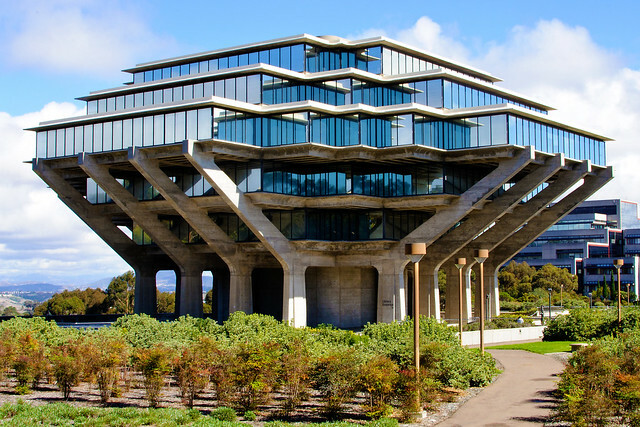 The unforgettable UCSD library. Photo by SD Dirk. We’re giving talk to about 300 students enrolled in the Introduction to Communication and Culture class. We’ll be sharing our journey from being an upstart start-up (pun intended) to the indie brand people know and hopefully love, with more than a few anecdotes thrown in. While preparing for a talk, we came upon this pictures from our very first art show. Can you see the love? You can see more shots from that epic night here. We’re super excited to be there tomorrow and Angie hasn’t even seen her campus since she graduated. We’ll be giving the talk to a class of Communications majors, the same program Angie finished. If you do decide to stop by (yay! ), get a parking ticket at the machine in the Extension lot (first lot on Muir College Drive (near the Torrey Pines North turn-in).